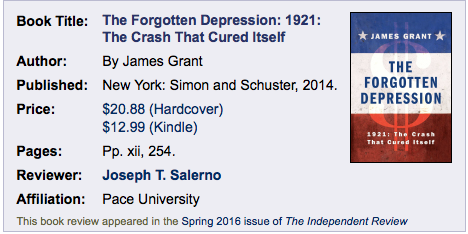 The Forgotten Depression is a narrative history of the depression of 1920–21. Although it is informed by a very definite theory—the Austrian business cycle theory—it is not a standard work in applied economics. It does not first present the theory in a rigorous formulation and then move on to apply the theory by adducing pertinent qualitative facts and statistical data to explain a complex historical event such as a depression. It instead proceeds by way of anecdotes and contemporary media accounts, liberally seasoned with telling quotations from politicians, policy makers, economists, business leaders, and other contemporary observers of the unfolding depression. Data on money, prices, and production are inserted at crucial points to keep the reader abreast of the economy’s precipitous decline, but they do not dominate and weigh down the story. James Grant, a masterful stylist, effectively weaves these disparate elements into a seamless and compelling narrative that never flags in pace or wanders off track. The book should appeal to a wide variety of readers, from college students and business professionals to academic economists and policy makers. To understand the liquidationist position, one must first grasp its foundational concepts and assumptions. In the world of the early 1920s so richly portrayed by Grant, there was no national macroeconomic entity with which economic theory and policy were concerned: “As far as the political-economic mind of 1920 was concerned, there was no ‘U.S. economy.’ And as the economic totality was yet unimagined, so too was the government’s role in directing, managing and stimulating it” (p. 128; see also p. 67). Economists—with a few notable exceptions—did not think of the “price level” as a unitary statistical construct or worry overmuch about its fluctuations. Nor did they try to calculate “aggregate demand” or total spending or even consider either relevant to economic performance. Indeed, for most economists, the core of the market economy was the interdependent system of money prices, including wage and interest rates. Money prices were seen as the foundation for the calculations of revenues, costs, profits, and asset values upon which entrepreneurs based their resource-allocation decisions. Furthermore, it was widely recognized that money prices were in constant flux as they coordinated economic activities in the face of ceaseless change in consumer tastes, business organization, technology, population, labor skills, and so on. As Grant aptly and incisively expresses his theme in the preface, “The hero of my narrative is the price mechanism” (p. 2). The favorable view of liquidation as a cure for depression thus arose naturally out of the belief that the price mechanism, when left undisturbed, benignly adapts resource allocation and production to the underlying economic realities. As Grant points out, to liquidate, as the term was used at the time, simply meant “to throw on the market” (p. 172). In this sense, “liquidating” labor, inventories, farms, and businesses was a call to allow the price system to operate to discover the configuration of wages, prices, and asset values appropriate to the reemployment of idle resources in the production of goods most urgently demanded by consumers. If this price adjustment incidentally resulted in deflation, then so be it. In lieu of the fictitious concept of a unitary price level, inert and resistant to movement, money prices were conceived as naturally and fluidly (but not instantly) moving up and down like a swarm of bees in flight. The fact that the “price swarm” might be ascending or descending would not inhibit and, indeed, might be required to facilitate necessary changes in the relative positions of money prices. (The metaphor of a “price swarm” wasn’t coined until 1942 by Arthur W. Marget in The Theory of Prices: A Re-examination of the Central Problems of Monetary Theory, 2 vols. [New York: Kelley, 1966, pp. 2:330–36], but it aptly describes the earlier classical-liquidationist view of the value of money.) Deflation presented no special problem because the classical view of the value of money still prevailed. In this view, money’s value was simply the unaveraged array of money prices inverted to reveal the alternative quantities of each good or service that exchanged for the money unit—for example, the dollar. Money prices fluctuated freely, so then must the value of money, which was determined in the same integral market process. Grant’s judicious choice of quotations shows how pervasive and deeply ingrained was the view that the only sure cure for the depression was deflation and liquidation of overblown resource and asset prices. Here are some examples. Benjamin Strong, the governor of the Federal Reserve Bank of New York, foresaw the need for deflation and liquidation at the height of the postwar boom in 1919, writing that an anticipated change in Federal Reserve Board and Treasury policy “will insure during the next year or two a very considerable liquidation of our banking position . . . and a considerable decline in the price level” (qtd. on p. 92). The Berkeley economist Adolph C. Miller, a member of the Federal Reserve Board, opined in 1919, “Where there has been inflation, there must follow a deflation, as a necessary condition of economic health,” although Miller doubted that this deflation could and would be done (qtd. on pp. 94–95). Another member of the board and concurrently the comptroller of the currency, John Skelton Williams, in early 1921 viewed the global collapse of commodity prices as “inevitable” and welcomed the day when “the private citizen is able to acquire, at the expenditure of a dollar of his hard-earned money, something approximating the quantity and quality which that dollar commanded in prewar times” (qtd. on p. 118). As Grant concludes, the entire Federal Reserve Board was in remarkable agreement: “A continuing, drastic and perhaps violent rollback in prices, and therefore in wages, was the way forward” (p. 118). The Federal Reserve Bank of Boston identified “two important conditions precedent to the laying of enduring foundations for the future stability of business, namely, liquidation and deflation ... and an increasingly satisfactory banking situation with reserves augmented and loans decreasing [i.e., bank credit contraction]” (p. 120). A. Barton Hepburn, a former comptroller of the currency, also declared for bank-credit contraction and price deflation in 1920, lamenting, “The people of the country have by no means realized as yet the necessity for economy, liquidation of loans and curtailment in the use of credits. We will never be able to bring about the desired deflation until the general extravagance is curtailed” (qtd. on p. 98). Even some prominent academic economists took up the case for deflation. Professor Edward W. Kemmerer of Princeton University, a leading monetary theorist, vigorously exhorted an audience of bankers in mid-1920, “We must have contraction. . . . We can’t go ahead with our business and make much progress . . . until we get substantial contraction” (qtd. on p. 125 n.). Politicians also joined the chorus calling for deflation. In his inaugural address in March 1921, President Warren G. Harding perceptively declaimed in its favor, “The economic mechanism is intricate and its parts interdependent, and has suffered the shocks and jars incident to abnormal demands, credit inflations, and price upheavals. . . . Prices must reflect the receding fever of war activities. . . . We must face a condition of grim reality, charge off our losses and start afresh [i.e., liquidate]. It is the oldest lesson of civilization” (qtd. on pp. 135–36). There was no fear among contemporary observers that, as current macroeconomic jargon would put it, “aggregate supply curves” would shift slowly and painfully to the right because entrepreneurs’ and workers’ expectations would adjust very slowly to the new reality. For liquidationists, in contrast, deflation would proceed very rapidly because bankers, investors, entrepreneurs, and consumers expected it to do so. And they expected it to do so because the intellectual paradigm and the monetary policy regime fostered such expectations. Even though the Fed was up and running, it did not yet see its task as preventing money prices from adjusting to changed conditions of money supply and demand. Contemporary economic observers also did not fret about the modern specter of a runaway deflationary spiral that might result from plunging prices stoking expectations of further declines in prices and inducing consumers and entrepreneurs to delay purchases into the indefinite future. The reasons they ignored such an eventuality were obvious. First, such an event had never been experienced previously under the gold standard. Second, according to the liquidationist view, credit contraction and deflation was the most expeditious method for realigning money prices and costs, in particular wage rates. It was well understood that capitalists and entrepreneurs did not react to some abstract price level but to actual or expected price margins. Deflation under a freely operating price mechanism did not just lower the height of the price swarm but also deftly reconfigured it so that price margins expanded to the point where entrepreneurial pessimism and malaise gave way to optimism and energetic risk taking. The liquidationist policy was criticized at the time by a small but notable group of economists, foremost among them Irving Fisher, John Maynard Keynes, and the Swede Gustav Cassel. These economists formulated what came to be known as the “stabilizationist position,” according to which maintaining a constant price level was the necessary and sufficient condition for ridding the economy of business cycles, especially depression and unemployment. For these economists, deflation was “a cruel and colossal blunder” (p. 123). Cassel denied that gradual deflation was possible and foretold that the Fed would not be able to control the rate of descent of prices or the level to which they would tumble. Writing two years after the 1920–21 depression had already ended, Keynes claimed that deflation would induce “everyone in business to go out of business for the time being” and “everyone who is contemplating expenditure to postpone orders so long as he can” (qtd. on p. 124). In any event, as Grant demonstrates, the liquidationists proved to be correct. Cassel’s dire warning that deflation, once unleashed, would become unhinged from economic fundamentals was not substantiated. And Keynes’s dire assessment of the effect of deflation was proved false two years before he wrote it down. During the depression, total spending or nominal gross national product (GNP) tumbled by 24 percent from $91.5 billion in 1920 to $69.6 billion in 1921, and real GNP shrank by 9 percent. As Grant puts it, there was a “perpendicular plunge in commodity prices,” which never before had “fallen so far and so fast” (p. 182). Both farm prices and wholesale prices plummeted by more than one-third in 1921. Unemployment reached 15.3 percent in 1921. But despite “the breakneck rate of decline” of prices—or rather because of it—the liquidation process came naturally to an end, and prices reached a finite bottom beginning in March 1921. Contrary to Cassel and Keynes, deflation did not continue indefinitely or bring about a cessation of all economic activities and business expenditures. In fact, the U.S. economy entered a remarkably strong and rapid recovery in 1921 (pp. 186–90). Paradoxically, in the immediate aftermath of its greatest triumph, the liquidationist position was completely discredited and placed beyond the pale of rational discourse. By the mid-1920s, the early Fisher–Keynes macroeconomics of price-level stabilization swept the field in the English-speaking world. Under the sway of this sophisticated brand of monetary crankism, policy makers and politicians deliberately disabled the price mechanism and ensured that less than a decade later a garden-variety recession would be transformed into the tragedy of the Great Depression.